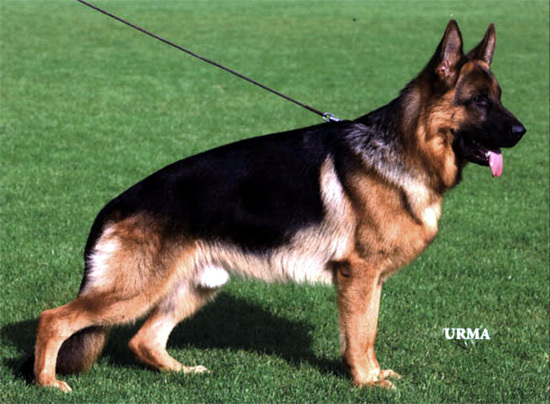 KOER REPORT: 2004 Sieger Show Report: More over medium, medium strong, type and expressive, impressively strong male with very good head, high Withers, good back line and good length and situation of the croup. It is very well hind in the pre and hind angulation and shows already very good chest plant. The front is correct, it goes from the front and in the back regards clean and shows in each desired pace momentumful gait with free precedence and effective supply. From its appearance expressed father-typically, with remarkably good head and salient typical male expression. In very good condition was introduced to the male, over its paternal line quantity and Dux offers it connection to the max visa Jeck line and is coined/shaped also of this appearance.